S Berman, D Spicer. Safety and Reliability of Lactobacillus Supplements in Seattle, Washington (A Pilot Study). The Internet Journal of Alternative Medicine. 2003 Volume 1 Number 2. In this pilot study, Lactobacillus supplements in Seattle, Washington were analyzed as to safety and reliability. The contents of twenty brands of Lactobacillus supplement were cultured for viability. Microorganisms isolated from the samples were identified as to genus and species using DNA analysis. Results were compared to contents stated on the bottles. One of the brands tested had organisms isolated that were identical to those stated on the bottle. 30% of the samples had contaminants and 20% of the brands had no growth. Viability of the samples was significantly (p=.014) associated with refrigeration status. From this pilot study it appears that Lactobacillus dietary supplements examined in the Seattle, Washington are not reliable and may not be safe for the consumer. The source of any support: This research was supported by a faculty seed money grant from Bastyr University. Probiotics are defined as microbial food supplements that beneficially affect the host1. Most probiotics include live cultures of bacteria or yeast and are available in many forms. These forms include yogurts, fermented or fortified milk products, and dietary supplements. Of the many microorganisms that are used as probiotics, the ones most commonly used by the professional and general population include bacteria of the Lactobacillus genus, particularly Lactobacillus acidophilus. Lactobacillus dietary supplements are readily available to the public through many sources including pharmacies, health food stores, drug stores and groceries. A number of probiotics, particularly those of the Lactobacillus species, are being used to produce health benefits for a variety of conditions and diseases in people throughout the world. Many of these effects have been scientifically supported. These include improving the health of the intestinal tract 2,3, decreasing the prevalence of vaginal infections and sexually transmitted diseases 4,5,6,7,8, increasing immune function 9,10, and decreasing cholesterol and lipid levels 11,12. There are many questions that need to be addressed concerning Lactobacillus supplements, regardless of source, as these supplements are not regulated for purity, viability or efficacy by the FDA since the deregulation of the dietary supplement industry by the Dietary Supplement Health and Education Act (DSHEA) in 199413. The most important of these questions is whether these supplements contain viable microorganisms. A second question is the purity of the supplements, including the identification of potential pathogens contaminating these supplements. A third essential piece of information is the identification of the Lactobacillus species themselves. Are they the species that are advertised or are consumers ingesting bacteria of unknown speciation? In 1990, Hughes and Hillier reported on 16 Lactobacillus containing commercial products, such as milk and yogurt, available in the Seattle area15. Of the products examined, only four contained Lactobacillus acidophilus, and eleven contained one or more contaminants. The contaminants included potential human pathogens such as Pseudomonas species15. To test the viability and purity of Lactobacillus supplements available from varied commercial sources in Seattle, Washington. To determine the speciation of viable Lactobacillus organisms as well as contaminants. To obtain Lactobacillus dietary supplements from several commercial sources around Seattle Washington, noting price and storage conditions at place of purchase. To culture the supplements for viability and purity and to determine if there is a significant association between viability or purity and cost or storage conditions of the supplements. To isolate and identify, via DNA molecular technology14, the contaminants found in samples and determine if they are potential human pathogens. To isolate and identify, via DNA molecular technology14, the species of isolated Lactobacillus. Twenty bottles of Lactobacillus supplements were obtained from several sources in and around Seattle, Washington. Included as sources for Lactobacillus supplement purchase were pharmaceutical and herbal companies, Bastyr University clinic dispensary, various health food stores, drug stores and groceries. All supplements were chosen prior to their expiration date. Those supplements that were refrigerated at the source were kept refrigerated until sampling. Those that were not refrigerated were stored until sampling time at room temperature. All samples were “blinded” by a technician so the microbiologists only knew the sample by number. Four capsules were removed individually and aseptically from each supplement bottle and placed into 7 mL of sterile Brain Heart Infusion (BHI) broth using sterile technique. Prior to transfer into media, the individual bottles of supplements were wiped down with 70% isopropanol under an operational and regulated laminar flow tissue culture hood. The broth was incubated at 37C long enough to dissolve the capsule (average of 15 minutes) and plated onto MRS, Sheep blood agar and MacConkey media, using sterile technique. Plates were incubated at 37 degrees C under aerobic and anaerobic growing conditions. All broth samples were also gram stained to detect species that may be present but were not viable. All viable species were isolated. Twenty-four hour pure cultures of these bacteria were then sent for speciation via DNA probe analysis to Midilabs, Newark, Delaware using appropriate shipping protocols14. Analysis results were compared to known databases and the genus and species were sent to the authors from Midilabs with the confidence level of that match. Pure cultures known to the authors but unknown to the reference lab were also sent to Midi labs as a quality control measure. Data and statistical analyses were performed using SPSStm for Windowstm Version 1015 Measures of product viability, purity and median price were compared for refrigerated and non-refrigerated samples. The median price was also compared along the measures of viability and purity. Continuous variables were analyzed using the Mann-Whitney test and two-tailed Fischer's Exact test was employed to test differences between proportions. P values of less than .05 were considered statistically significant. Of the twenty different supplements examined, twelve were refrigerated (see Table One) and eight were not refrigerated (see Table Two). One of the samples from refrigerated storage and none from room temperature storage had organisms isolated exactly as advertised on the bottle and were free of contaminants. Contaminants were cultured from six samples (30% of those sampled) with five contaminated samples belonging to the refrigerated group. Contaminants included several gram negative rods, Bacillus species and Enterococcus faecalis. Four supplement brands (20% of those samples) had no growth on either aerobic or anaerobic media. Three of these nonviable supplements were from the non-refrigerated group. However, three of the supplement brands with no growth on the media had gram positive rods in the gram stain of the BHI broth indicating nonviable organisms of indeterminate species. 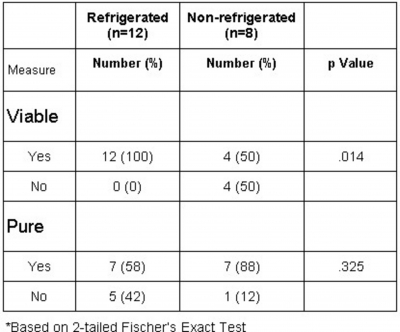 Viability was significantly (p=.014) associated with refrigeration status (see Table 3) with 100% of the refrigerated samples proving viable compared to 50% of the non-refrigerated. However, there was no significant association found when comparing purity of refrigerated to non-refrigerated products. 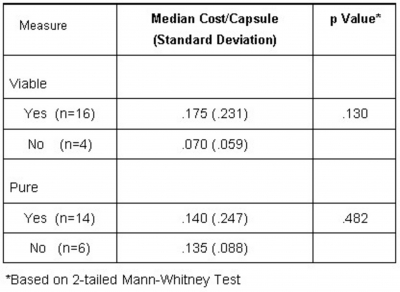 While the median price of refrigerated samples ($0.20/capsule) was more than non-refrigerated specimens ($0.08/capsule) there was no significant difference in the median cost of viable versus nonviable or contaminated versus pure products (see Table 4). It is interesting to note, however, that the one product found to be a viable, non-contaminated supplement identified as the organism advertised on the bottle was also the most expensive per capsule. Information obtained from this study as to viability, purity, and speciation of Lactobacillus supplements is essential to public awareness. Lactobacillus supplements are in very common use by health care practitioners and the public. These supplements are used to treat a variety of medical conditions within a variety of patients, including those that may be immune compromised. 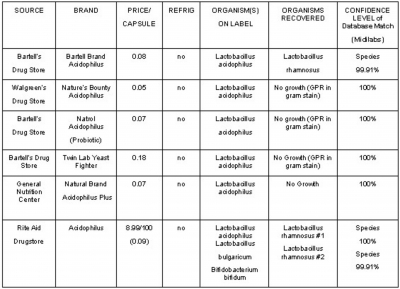 As seen in this pilot study of 20 brands of Lactobacillus dietary supplements in the Seattle area, most supplements did not have organisms isolated which matched the description on the bottle of the product. Although an exact match of genus or species is not an automatic indication of potential problems, due to possible renaming of species, isolating unexpected micro-organisms are likely to be more problematic. If this pilot study is representative of all Lactobacillus supplements available to the public, there may be a significant problem involving these supplements. On one hand, some Lactobacillus dietary supplements may contain non- viable micro-organisms resulting in misleading health care practitioners, their patients and consumers as the products will fail to produce the desired benefit. On the other hand, some Lactobacillus supplements may contain potential pathogens that may induce serious infections in an immune compromised or otherwise susceptible persons. Van Goor, et al described bacterial translocation from the intestinal tract to various body tissues in organ donors16. In addition, bacteremia caused by Lactobacillus, alone or in combination with other organisms, has been described in much healthier individuals17,18. Additional broader studies examining all Lactobacillus supplements in the State of Washington are necessary and underway. The ultimate goal is for consumers of Lactobacillus dietary supplements to be able to identify the brands that are safe, viable and reasonable in cost. The authors were unable to determine if the viability and purity problems seen with the Lactobacillus supplements were due to manufacturing, packaging, transportation or distribution problems. It was also not possible to determine if all products of that particular lot number or from the same company would produce identical results. 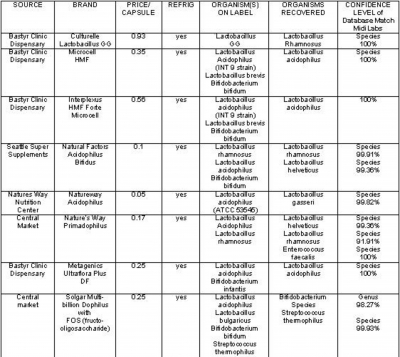 Furthermore, identification of species from specialized or industrial strains of Lactobacillus were limited by our database. 2. Rolfe RD. The role of probiotic cultures in the control of gastrointestinal health. J Nutr 2000;130(2S):396S-402S. 4. Eschenbach D, Davick P, Williams B, Klebanoff S, Young-Smith K, Critchlow C, Holmes K. Prevalence of hydrogen peroxide-producing Lactobacillus species in normal women and women with bacterial vaginosis. J Clin Micro 1989;27:251-256. 5. Reid G. Probiotic agents to protect the urogenital tract against infection. Am J Clin Nutr 2001;73(S):437S-443S. 9. Meydani S, Woel-Kyu H. Immunologic effects of yogurt. Am J Clin Nutr 2000; 71:861-872.